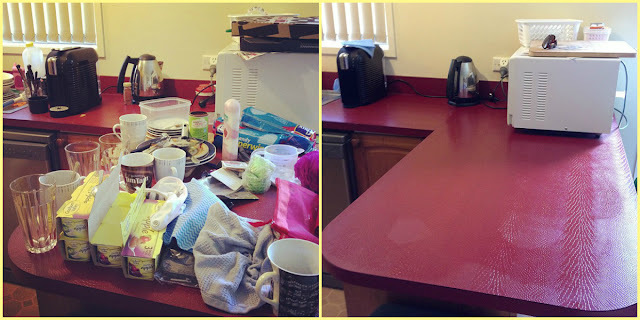 Before & After - On the left is what my kitchen often looks like on a Monday morning after a busy weekend spent here, there and everywhere but at home! Only took me about 40mins to get it clean! 1. My gorgeous sister Katie got herself an iPhone and joined up to Instagram. You should totally follow her, her username is KT90LN | 2. My little after-bath cheeky-chops! | 3. #fmsphotoaday Work/Play | 4. #fmsphotoaday What You Wore | 5. Punky has loved "Where is the Green Sheep to death. Literally! My little daredevil birthday girl, sitting at the top of the slide on her birthday on Friday, just about to go down all by herself! 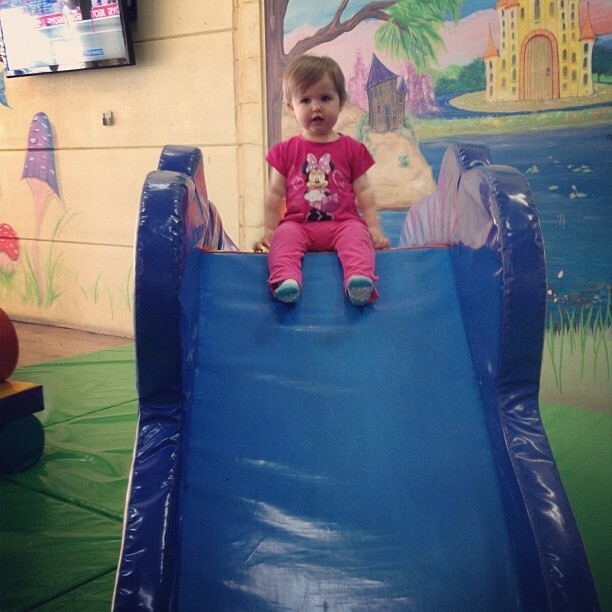 She loved that slide so much she kept wanting to go down by herself, over and over! 1. Presents all wrapped up for the birthday girl | 2. #fmsphotoaday Grateful :: so grateful for awesome friends and family | 3. Punk watching and waiting while Daddy opens up one of her presents from the box | 4. Maxed out on the lounge her Aunty A got her, playing with the iPad in it's sweet new protective, kid-friendly case from Kelly HTandT | 5. #fmsphotoaday Black :: on Friday we also went to my Mum's for the annual decorating of the tree | 6. On Saturday morning it looked like a block factory had exploded in my lounge-room. Starting to re-think that present! Today was the party for my beautiful little munchkin's 1st Birthday. It was a stinking hot 38 degrees today and thankfully we took the water table down to the park where we had her party so all the kids could have some water fun. The adults were seriously jealous of the wet kids. Punky had a total ball and got absolutely soaked, but she was cool and happy and that's all that matters! 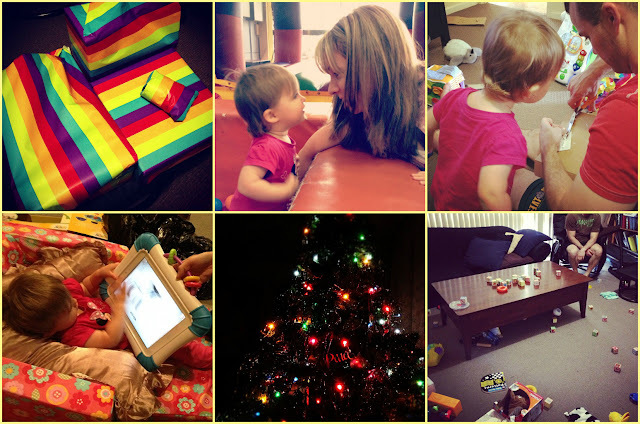 This week has been such a hectic one, with so much going on, culminating in my baby girl's birthday and party. This coming week is going to be just as busy with the lead-up to my sister Kate's wedding on Saturday and I can't wait! How has your week been? Are you on Instagram? If you are you should totally link up with the fab Tina Gray for the best iphoneography link-up around, My Week According to Instagram! I have completely lost touch with #fmsphotoaday last week. Hopefully I'll get back into it. Love the photo of your Christmas tree! We so need to get our act together. I'm with Grace - slipped off the FMS wagon last week unfortunately. Hopefully I'll get back on it! Mia on the slide, hilarious! She loved it so much, cutest thing ever. Happy birthday Mia! Looks like she had an awesome day. Only 40 minutes you say? You must have super powers, I hate my dishes with a strong passion, it takes me that long to get started! 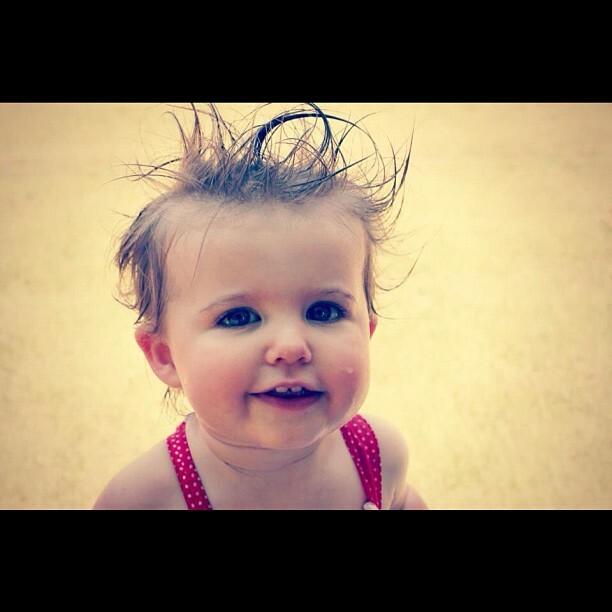 Looks like a great week, little Mia is just too cute!